The past 6 months have been busy. Family life is full of joys and struggles watching my stepdaughters grow their wings and my preschool little boy become a child with expansive curiosities. Breaking my arm in September did not stop me from my regular walks, online teaching and household tasks, although it did slow me down a bit in art making. Fortunately, I have stocked up piles of inventory that are hard to miss when walking through the narrow aisle of boxes that have taken over my studio and office space (much to my husband's dismay). Knowing that I had enough artwork framed, I decided to keep my goal of showing my art locally and sought out venues. New Seasons, Arbor Lodge, has been a welcoming neighbor when teaching at Ockley Green School. 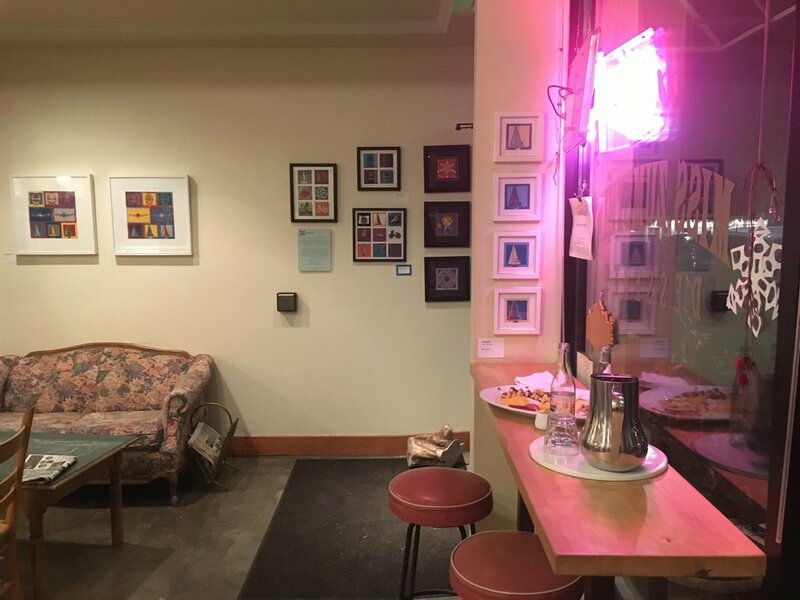 They opened their walls for student artwork and even hosted a benefit art show in 2016 for artists and art teachers to sell their work in support of an art teacher friend. When I reached out to my contacts there about having a solo art show, Allison happily agreed to have my art up for a month. It is a small space in the dining area with brown and orange walls, so not the prettiest gallery space but it gets a lot of traffic. Luckily I hung the show on September 1, just days before I had my fall and needed surgery on my forearm. I was hesitant to advertise this show too much but did have a few friends text me saying "I just saw your art up at New Seasons!" Then I received an email in November from a sweet little cafe, Miss Zumstein, just a few blocks from where I live. I spoke with Anja last year and she was now planning art shows for 2018. So I jumped at the chance to cover her white walls with some brightly colored paper cuts for the month of January. The opening celebration was held on a Saturday afternoon and the room was filled with warmth and smiles from many friends and neighbors. It was a joy to share my series of work from the past year and a half with my local community!